If you’ve been following my blog for any amount of time you are probably aware of how much I adore the Pantene Beautiful Lengths program. If you’re not sure what I’m talking about, that’s the amazing program where Pantene has partnered with the Canadian Cancer Society to take donations of cut hair and turn those ponytails into real hair wigs for women battling cancer, which are then distributed free of charge — awesome, right? What you may not realize is that each Autumn Pantene organizes a National Donate Your Hair Day to help drive hair donations. And well, it’s that time of year again folks. Time to start thinking about shearing your locks for a good cause, because this Saturday is National Donate Your Hair Day. 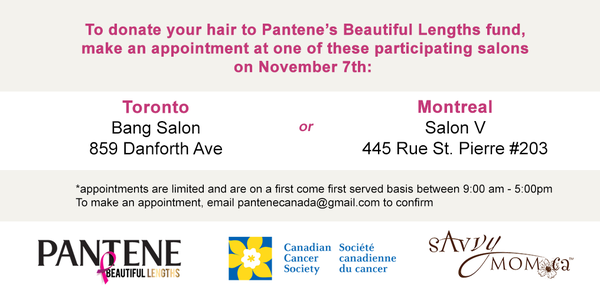 If you are interested in donating your hair and will be in the area of Toronto or Montreal on Saturday November 7th you can book a complimentary hair cut at one of the select salons taking part in this event. As of when I’m publishing this post I am uncertain as to how many slots are left available, if you’re interested please email pantenecanada@gmail.com directly to confirm availability. Keep in mind that to donate your hair your pony tail must be a minimum of 8 inches long, the hair needs to be less then 5% grey, and it can’t be permanently coloured or treated. You don’t need to attend the events in Toronto or Montreal to take part in National Donate Your Hair Day. 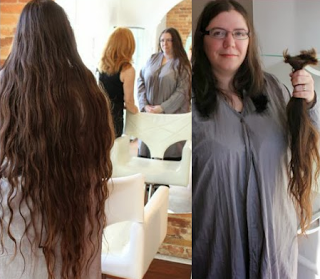 You can go to any salon, or even just cut your hair at home, and then mail it in to Pantene Beautiful Lengths. Again, remember your ponytail needs to be a minimum of 8 inches and your hair has to be less then 5% grey, and can’t be permanently coloured or treated. If you do it on your own you can still take part in the event virtually by sharing a picture online with the hashtags #BeautifulLengths and #8or8 and tagging @Pantene on Instagram or Twitter. I’m looking forward to following the hashtag on Saturday and seeing plenty of people sporting sassy new shorter hairdos. If you’re cutting it on your own just follow the very simple instructions on the Pantene Beautiful Lengths website for how to make the cut (or you can print out this sheet and bring it to the salon with you, if you’re worried they won’t know how to prepare hair for donation). You also don’t need to specifically cut your hair on November 7th, Pantene Beautiful Lengths is an ongoing program which accepts donations year round. If your hair isn’t quite there yet, you can grow it out with the intention of cutting it during next year’s event (or at any point, really). On average a person’s hair grows half an inch a month, which means it takes about 16 months to grow an 8-inch ponytail to donate. 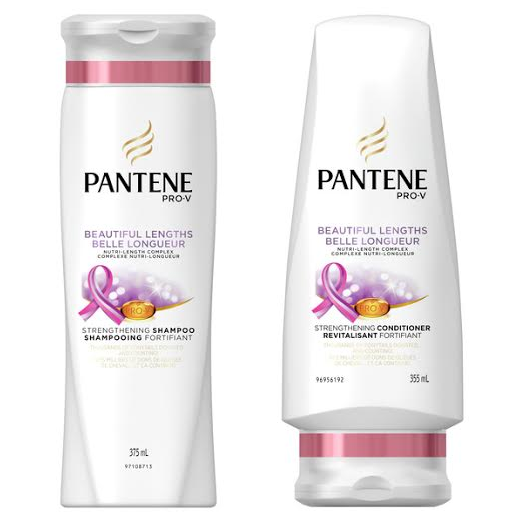 Pantene Beautiful Lengths Shampoo and Conditioner is specially formulated to strengthen hair against damage, to help you grow long healthy hair, perfect for donating. This year Pantene is challenging folks to either donate 8 inches of hair, or donate $8. Cash donations will be used to help offset the costs of turning donated ponytails into wigs. You can donate any amount, $8 is just the suggested minimum. You can make your donation to the Pantene Beautiful Lengths Fund at this secure site. So what will I be doing to support Pantene Beautiful Lengths this year? Well, as most of you already know in February of 2014 I donated 24 inches of hair to the Pantene Beautiful Lengths program. My hair, which grows at a ridiculous rate, is now back to waist length. However last fall I took part in an event with Clairol where I dyed my hair. It may seem silly, but I’ve been feeling guilty about it ever since. I just dyed it the once and then let it grow out, and it was over a year ago now, but I’m pretty sure that disqualifies my hair from being donatable. Either way I wouldn’t be available to cut my hair this Saturday because I’m going to be busy on November 7th taking part in Extra Life 2015, playing board games for 24 hours straight and raising funds for SickKids Toronto. Last Fall my daughters both took part in National Donate Your Hair Day. From the moment I cut and donated my hair they were itching to copy me. I waited a few months to make sure it was something they really wanted to do, and then took them to a local salon to make the big cut. 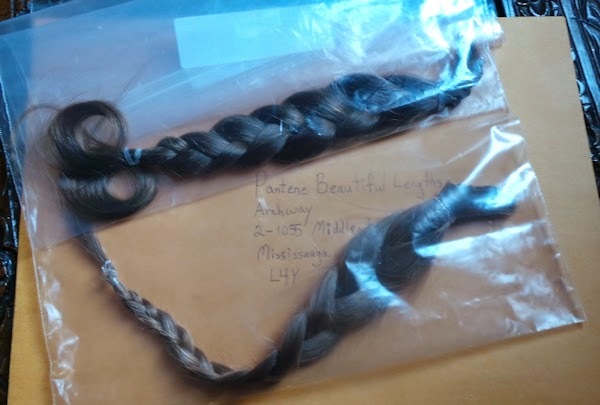 We mailed their ponytails in to Pantene Beautiful Lengths and then a few weeks later they each received personalized thank you letters, which they found pretty exciting. 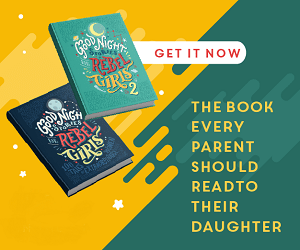 However, this year the girls aren’t participating, one has hair that is far too short and the other has decided she is growing her hair “down to her feet and forever”. I have to admit it feels very odd to be doing nothing this year. Which is why I love that they’ve added the new option of donating money to the program, This year that’s what I’ll be doing. Donating cash in lieu of hair. What about you? Will you be giving hair or money this year? Are you going to take part in the #8or8 challenge? What a great cause! I recall when you cut your hair ! What a great donation. I would love to participate but unfortunately my ponytail has been highlighted but I will help in the other ways that you suggested.